New Zealand professional athlete Piri Weepu was shown on television giving a 6 month old baby a ….bottle of formula. La Leche League, a pro-breastfeeding organisation, has taken offence from a few seconds of film showing the All Black tenderly feeding a bottle of milk to daughter Taylor. The brief scene has been cut from an anti-smoking ad, due to complaints from the league. Weepu became a national hero during the All Blacks’ World Cup-winning campaign. The Health Sponsorship Council’s TV ad is part of its “Smoking, Not Our Future” drive and features Weepu at home with his two daughters: 6-month-old Taylor and toddler Keira. In it Weepu speaks about the positives of having a smoke-free home and car. … [T]he camera followed Weepu around for a day, including for an hour at his home while he played with his daughters. “He happened to feed the 6-month-old briefly while they were there,” [Health Sponsorship Council chief executive Ian] Potter said. People associated with the La Leche League initiated an email campaign against the ad, resulting in a “significant amount of feedback” to the council. Why did La Leche League oppose an image of a father lovingly feeding his baby daughter? La Leche League director Alison Stanton said the trouble wasn’t with Weepu bottle feeding but with the overall message. Right, we all know that bottle feeding kills thousands of babies in first world countries each year. Wait, what? It doesn’t kill any babies at all? Surely for La Leche League to vociferously oppose bottle feeding during an anti-smoking ad it must have double or triple the risks of smoking around infants and small children. Wait, what? There is no evidence that is harmful to first world children at all? Have these people lost their minds? What the hell do they think they are doing? What they are doing is behaving like lactofascists. They are not content with promoting breastfeeding. They want to moralize infant feeding and demonize bottle feeding. Most importantly, they want to show that good mothers (mothers like themselves) would never bottlefeed, would never even consider letting their husbands give the baby a relief bottle. The saddest thing is that the real breastfeeding issue of the day is whether moms should be able to pump and feed in public or at work. Bans on public breastfeeding are ridiculous – the idea that a woman feeding her child is offensive or indecent or inappropriate is, I think, offensive, indecent and inappropriate. And new mothers should have spots in their workplaces where they can pump or feed in privacy. Apparently Bob does not understand that the real issue for lactofascists is to demonstrate their own superiority as mothers and to shame anyone who doesn’t do exactly what they do. The ultimate irony of course is that many lactofascists support homebirth, although it demonstrably increases the risk of neonatal death. They insist that a woman’s right to control her own body means that she should be allowed to make any choice in birth, no matter how risky. Evidently, a woman’s right to control her own body applies only from the waist down, however. She has no right to control her own breasts. When it comes to feeding an infant, woman’s autonomy be damned. There is only one right choice and the lactofascists want there to be no mistake about it. 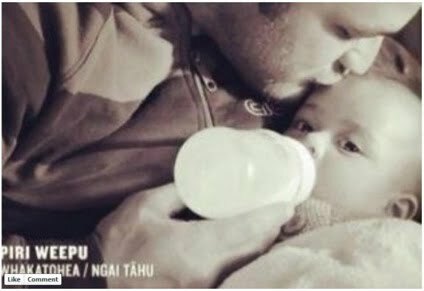 When Piri Weepu or any other guy is trying to be a good dad, let him be a good dad. Good dads feed their kids. Good moms feed their kids, too, and it doesn’t matter whether they do it by breast or bottle.